Ah, chocolate, cheese, and beer, how we love thee! 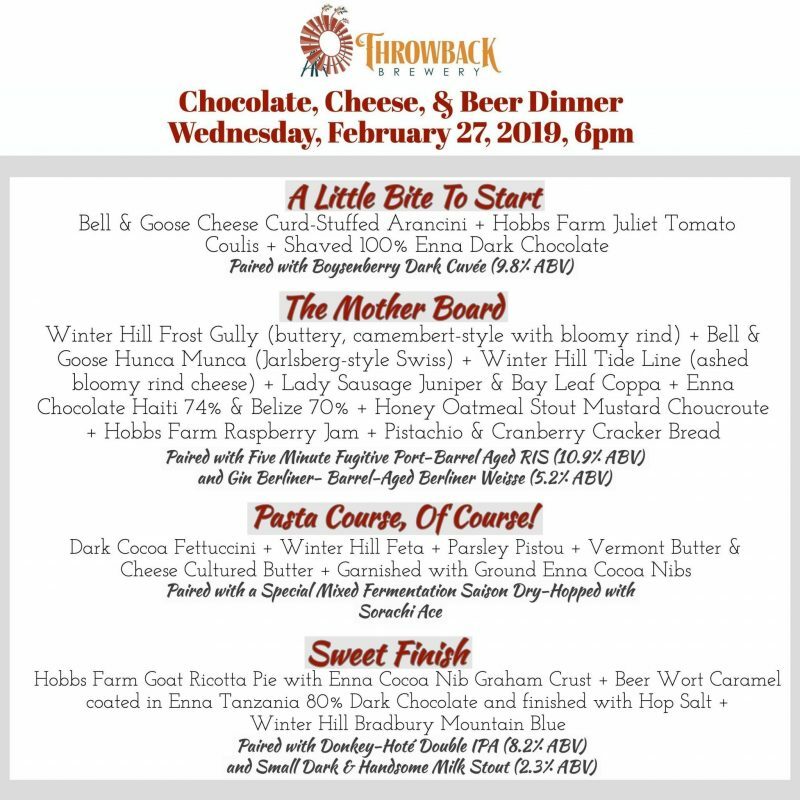 It’s been a long love affair for our team with these scrumptious food staples, and, now its going to be eight years of us holding an event where we challenge ourselves to push the culinary possibilities of pairing hand-crafted chocolate and thoughtfully selected cheeses from local New England artisans with our farm-fresh beers. This year, we are very happily highlighting cheese made by two exceptionally talented women – Anna of Bell & Goose Cheese (South Hampton, NH) and Sarah from Winter Hill Farm (Freeport, ME). Tickets are just $45 (plus tax and gratuity). We’ve made tickets available online – click here to purchase. Or, you can buy your tickets here at Throwback Brewery during our open hours. Or, if you feel more comfortable, please call 603-379-2317 or email [email protected] and let us know how many people in your party, as well as your phone number. We’ll call you back and get you squared away.